E.E. 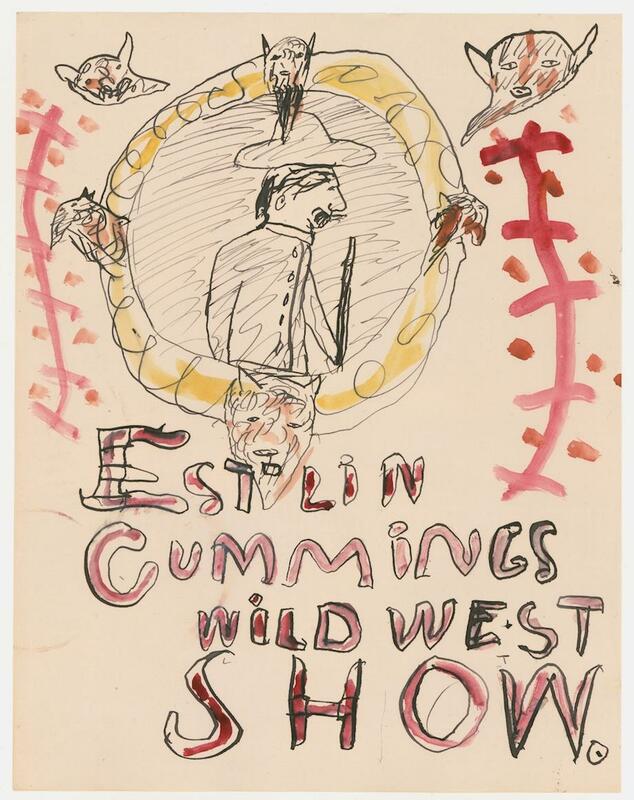 Cummings: The poet's childhood drawings depict a wild west show and a friendly rhino. Archivists at the Massachusetts Historical Society, while cataloging the papers of the family of E.E. Cummings, recently found caches of previously unseen writing and sketches from the poet’s early years. 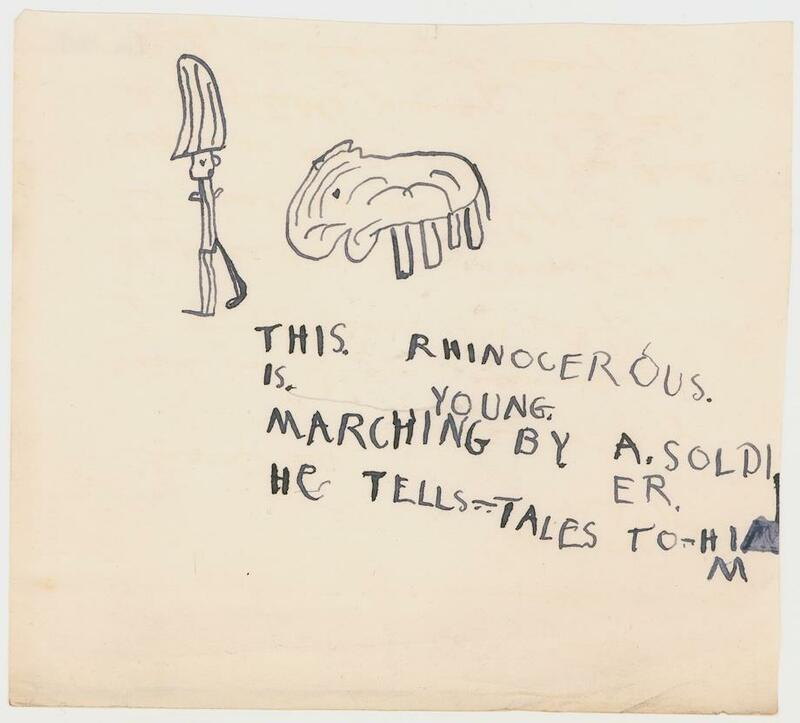 Here are two drawings by a 6- and 7-year-old Edward Estlin Cummings. The two sketches, made between 1900 and 1902, reflect Cummings’ immersion in the popular culture of the time: circuses, Wild West shows, and adventure fiction. The friendship between the rhinoceros and the soldier, sketched briefly in a single drawing accompanied by creatively punctuated text, could come straight from a H. Rider Haggard novel or one of the fantastic animal tales of Ernest Thompson Seton. 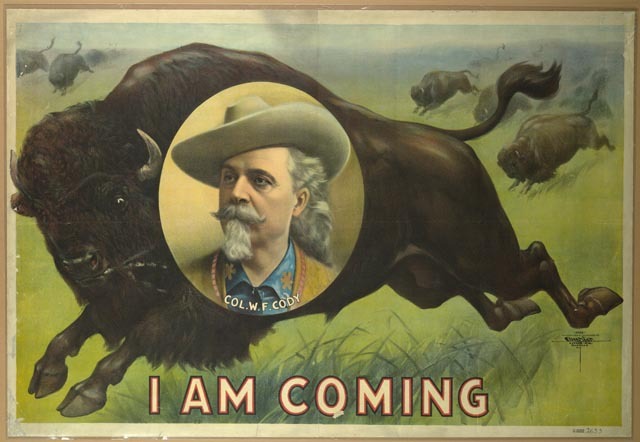 In the “Wild West Show” poster, the young artist pictures himself as a mustachioed impresario in military uniform, looking much like the dashing real-life showman William “Buffalo Bill” Cody. In later life, Cummings was to write a poem about Cody’s death—a work that reflected his onetime hero worship for the man, along with his more adult disillusionment in the “blueeyed boy”’s flashy showmanship. The young man’s fannish self-portrait and the older man’s ironic poem make a perfect pair. More of Cummings’ early drawings, along with a few written works of juvenilia, are on display at the Massachusetts Historical Society in Boston through Aug. 30. Artwork by E.E. Cummings. Used by permission of the Trustees for the E. E. Cummings Trust. Image courtesy of the Massachusetts Historical Society.